Despite being the planet of love and attraction, transiting Venus doesn’t usually create much of a stir. She moves quickly, aspecting natal planets, points or angles for about two days. If you feel her influence at all, you experience a gentle brush with possibility, unless she’s coinciding with stronger influences. But when Venus is retrograde, she grabs your attention. This will be happening from July 25th to September 6th, 2015. Venus slows down when she stations from direct to Rx (and vice versa). 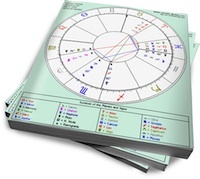 It’s possible that she can aspect something in your chart up to three times; once when she’s direct, a second time when she’s retrograde, and a third time when she moves forward. Bonus points if you have anything within one degree of where she’s stationing direct or Rx. This can extend her influence on your planet, point or angle for up to three weeks. That’s a lot of concentrated Venus energy. She’s underlining a sentence on the page of your love life, multiple times. ›› Try our transit reports for a personalized long-term forecast. Venus will station Rx at 0 degrees Virgo, then she’ll back into Leo, where she’ll station direct at 14 degrees. People are making a big deal out of her extended stay in Leo, but few want to dwell on the fact that Virgo will be part of this Rx period. And who can blame them? Venus in Leo is proud, magnetic and ready to show off. Venus in Virgo is focused on what’s wrong. Venus in Leo says “Love me now!” and Venus in Virgo says “Are you sure?” But you can’t ignore her dip into Virgo, because it’s a crucial part of this transit. Venus Rx can reconnect you with past loves. This can also be a time to reevaluate your current relationship, lack of relationship, or who you’re attracting. Venus rules Libra and Taurus, and no matter what sign she’s moving through, she’s expressing one of these two energies. Venus direct is Libra (how you relate to and attract others). Her energy is externalized. Venus Rx is Taurus (how you relate to yourself). Her energy is internalized. Venus Rx is not great for starting brand new relationships, but that doesn’t mean you should put everything on hold until she stations direct. If you connect with someone, by all means explore the relationship (if you want to). Sometimes there’s a loose end to wrap up. But once Venus stations direct, one or both partners could have a change of heart. On occasion, a relationship may move forward with Venus direct, but your best bet is to remain unattached to outcomes. I know — that’s next to impossible when you have feelings for someone. Venus’ initial Leo transit (June 5th, 2015 to July 18th, 2015) will set the stage by establishing Leo relationship themes: being noticed, being loved for who you are, and feeling special in the way you connect with others. When Venus enters Virgo (July 18th), there will be a shift in energy that acts a buildup to Venus’ Rx station (July 25th). You may feel doubts about what Venus in Leo stirred up — doubts about yourself or someone else. And those doubts will intensify once Venus stations Rx, because Virgo’s task is to push you to look at what’s really happening. What do they have to offer you? What do you have to offer them? Why are you still single? Venus Rx in Virgo is relationship hyper-analysis mode. The fact that this will be happening at 0 degrees Virgo is significant; it suggests that you can go no further until you back up and get real about Venus in Leo. Note that Venus will be stationing Rx on fixed star Regulus. This star was originally situated in Leo, but entered Virgo on November 28th, 2011. Regulus can bring success and glory, but will trigger a downfall if less than honorable actions are taken. In Virgo, these stainless standards have intensified. As Venus hovers over Regulus, integrity in relationships will be emphasized. You may be compelled to examine the standards you set, and how others treat you as a result. How do you react when you’re not appreciated? Has someone been dishonoring you? The concept of honor seems outdated, but I think it will be an issue during this transit. As Venus Rx backs into Leo (July 31st) she’ll be taking Virgo’s analysis with her. Venus in Virgo will have posed a specific question about your love life, and Venus Rx in Leo will be where you look for answers. Venus direct in Leo was about being noticed, but Venus Rx in Leo will ask you to hone in why and how you’re noticed. Or, why you’re being ignored. These will be valid questions whether you’re single or in a relationship. If you’re reconnecting with someone, be prepared for a repeat of old patterns, viewed through the Leo lens. Venus Rx in Leo will remove the fancy wrapping on the romance, and urge you to look at the truth (the buzzkill issue that Venus in Virgo first brought up). By the time Venus stations direct (September 6th) you should have all the answers you need about where you feel special, or where you’re being ignored, in your love life. Very important for me this transit because she will hit my natal planets Moon and Uranus in Leo.Thanks, Nadia. Venus will conjunct natal jupiter at 23 leo and natal pluto at 26 leo three seperate times.. seems a message I need to understand!! hope it is blatant so I can understand the lesson. Well guess who is Venus going to conjunct in Virgo? Saturn… I’m a Leo/Virgo, and I have Saturn at 0 degrees Virgo, this should be interesting. I am feeling this Venus in my 12 big time… huge. I guess knowing what Venus in the 12th represents, I am going to use it in my favor, going to make the energy work for me… also, I have mercury at 2 degrees Virgo, I wonder how is all going to play out. I will keep you posted! Why am I being ignored?Because I have freakn Lilith attached to my natal Venus at 22degs Leo-thats why!Im rejected by lovers cz I won’t bow down to any man.Im surrounded by Venus in Virgo men that sicken me with their hipocrisy.I can’t stand it for too long.And whenevr I receive decent amts of money it saddens me cz it reminds me of what I don’t have..intimacy and love..so I always give it away usually to th wrong types of people (deceitful).I dnt know how Im meant t use this energy positively other than channel my love for astrology.Im also attracted to th badboy/black sheep rebel types of men and Im ashamed of this.My SN is at 3degs Virgo..someone I need to forget and move on from?Wishful thinking (NN Pisces).Wish I knew how to change this energy.Make matters worse it forms a t square with a Neptune/Saturn opposition H5/11.Iv read elsewhere that Lilith imparts a gift depending on th natal house..I’d like to think my gift is astrology.Thank you Universe! usually the repetition makes the message pretty clear. please do keep us posted…it’s always interesting to see how these events play out. BML’s gift is her power, once the anger is focused in a productive way. During this Venus Rx, it’ll oppose my Jupiter and Mercury in Aquarius; then go onto conjunct my North Node, Uranus and Ascendant in Leo. It appears that this period will hit my chart directly in various forms. Hm. This should be an interesting time for me. I don’t have any planets in Leo but my Moon is at 1 degree Virgo, so that station period will be very close. Venus themes have been very difficult for me the past few years. I’m used to less-than-smooth sailing, because of my natal Venus-Saturn conjunction, but my Venus was also caught up with Uranus/Pluto and this part of my life has been ripped to pieces. My progressed Venus will also (finally) start to move out of opposition to my Chiron in early August. So, I’m thinking I should do what I can with Venus Rx to heal from all of this upset. Even if nothing manifests, I hope I can just start to feel ok again. all this seems to be about my 10th house.Venus RX will be in 10th conjunct MC, opposing my Sun at 1 degree Pisces. Sun rules my tenth house. It finally happened. Venus entered the shadow and he called. I’ve been waiting over six months. All that action on my 12H anti vertex (14 degrees leo) but no outward movement, until little old Venus got there. Now, let the games begin….